Controller events (MIDI continuous controllers, pitch wheel, NRPNs, and RPNs) appear in either the Notes pane or the Controller pane, depending on whether you choose to display the Controller pane or not. Each controller event has a tail, which graphically demonstrates the controller event’s current value. The tail changes colors to show whether you can edit a particular type of controller, and also turns dark to show that the controller event is selected. Controller events appear in different colors so you can differentiate them when you’re displaying multiple controller events, possibly in multiple tracks. Note: Only the current track and current events appear in a solid color. All other tracks and events appear in de-saturated colors. Controller tail. Color is strong when the controller is selected in the track’s Edit Filter. Color is dimmed when another controller type has focus. Selected. 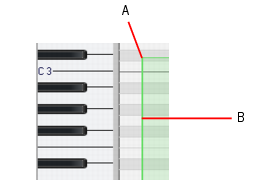 If a controller event is selected, the tail darkens in shade the way that selected notes do.